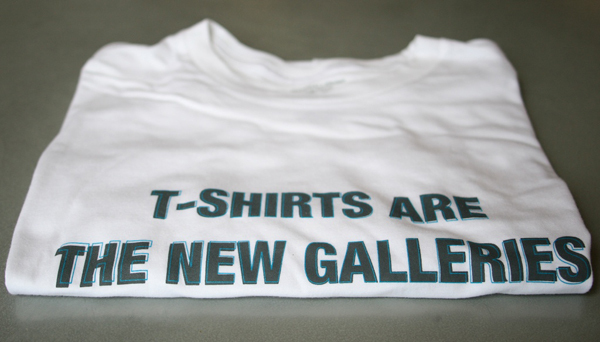 You heard it here first: Hyperallergic's "T-Shirts are the New Galleries" t-shirt designed by net artist Duncan Alexander. This is a development we’ve known here at Hyperallergic for some time, but we thought it’d be good to let our readers explore it further. The blurry line demarcating art and fashion is obfuscated when artists have a hand in designing clothes. Is it just a cheap ploy to stock the gift shop full of more merchandise? Probably. 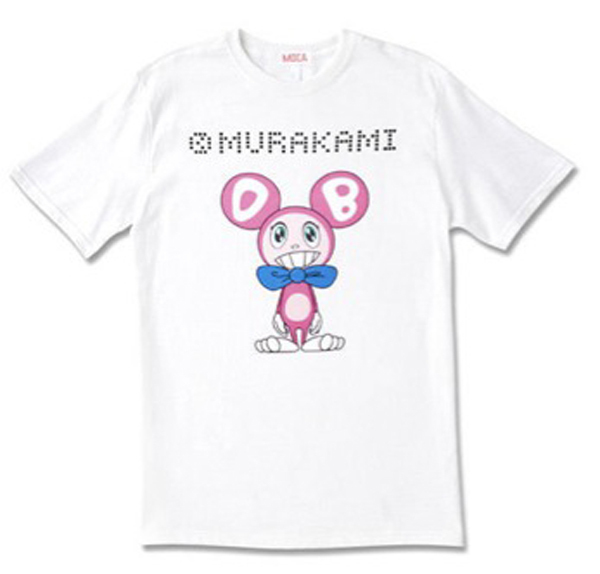 But bearing an artist’s creation in your personal presentation potentially imbues clothing with a lot of meaning. Before we begin, a note on wearing t-shirts bearing an artist’s vision: following the same rule as wearing a band’s t-shirt to one of their concerts, wearing an artist t-shirt at a gallery or museum makes you look like a pseudo-intellectual poseur who’s trying too hard and should be avoided at all costs. Unless that’s what you’re going for. But don’t fret! They’re appropriate attire in almost every other environment. 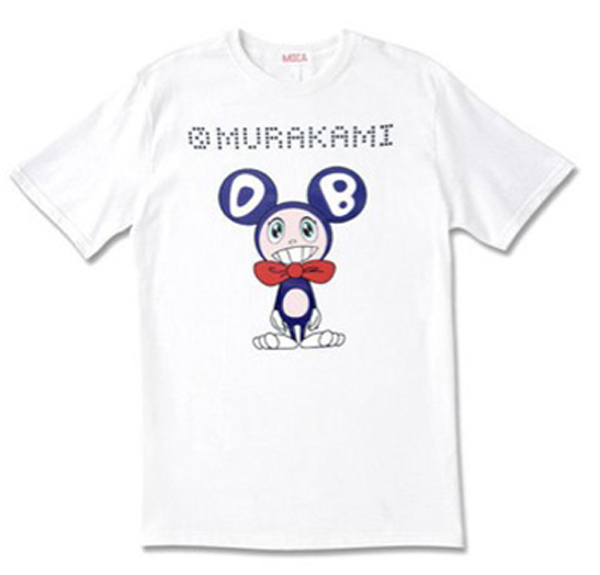 Let’s look at a run down of the most inspiring t-shirts designed by artists. 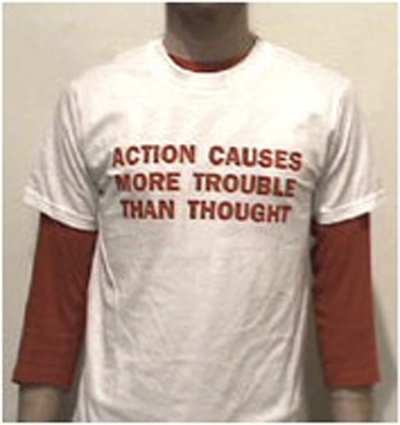 It’s probably a lot more thought provoking to have a t-shirt scrawled with a message by Jenny Holzer than some dude on CafePress.com. While it doesn’t have the same impact as an illuminated billboard in Times Square, it certainly adds an intimacy to her work. Just make sure to tell people an artist did it; otherwise they might not “get” it. 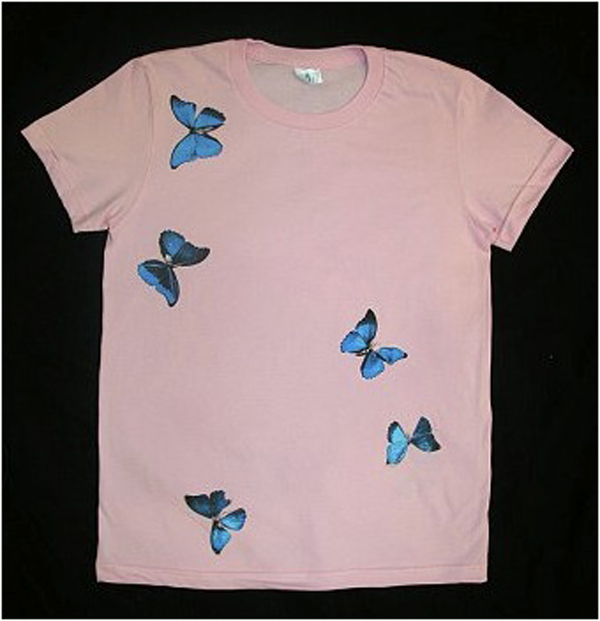 Produced in conjunction with his show Superstition at Gagosian, Hirst’s t-shirt features cerulean butterflies flitting on a soft pink background. 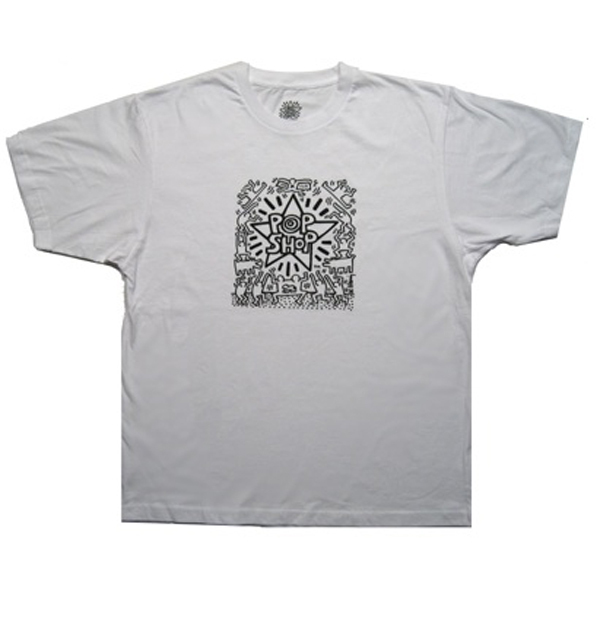 More so than all of these, this tee most suggests sticking two armholes in an artist’s canvas and walking around in it. OK, that doesn’t sound quite as elegant as expected, but still, you know what I’m getting at. 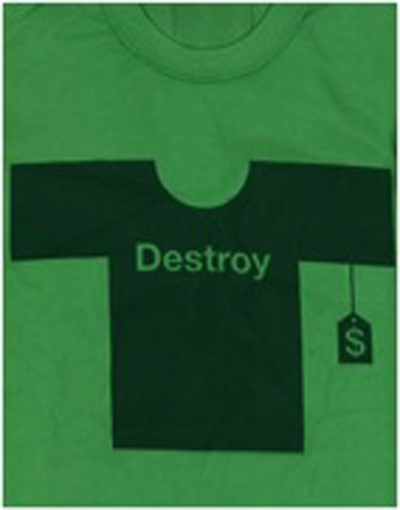 Playing off his motif of incorporating graphic iconography in his work, McGinness’s “Destroy” tee starts out well with an ironic tone-on-tone emblem of anti-consumerism. It’s sharp, and dubiously well intentioned, but wearing one might be too much of a hassle to strike a balance between simultaneously promoting and criticizing it. You can’t really discuss the collision of art and commerce without throwing Warhol into the mix, right? 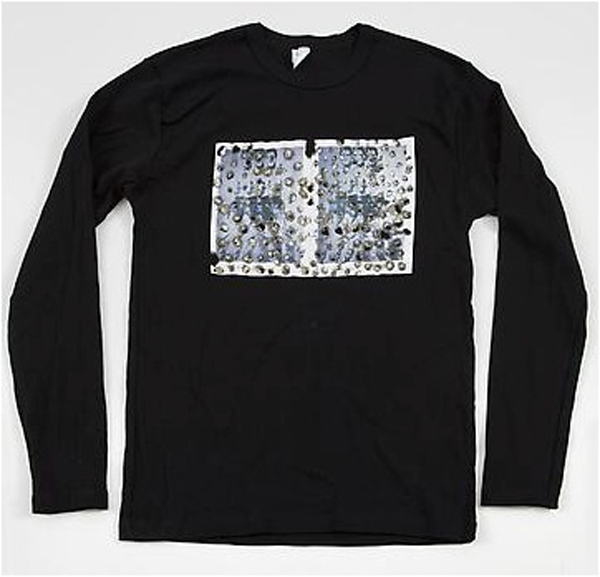 So when Douglas Gordon’s show appropriating the original silver fox’s silk-screens came to Gagosian, it was only natural to feature the prints on a t-shirt so even the lowliest of consumers could drop some money in the name of business art. Of course Damien Hirst would show up twice on this list, but this tee is a bit more versatile and iconic (sadly, not cheaper. These shirts are expensive, huh?). 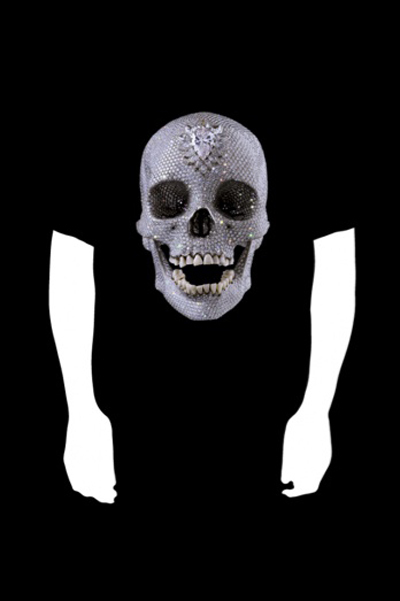 Unfortunately it’s not encrusted with real diamonds, but skull shirts are so ubiquitous, why not have a blinged-out one by Mr. Hirst? Foregoing the conversation of whether Haring actually designed these or not, the t-shirts decorated with his cave painting-like icons are pretty sharp and probably very recognizable to the masses. The average person may not know who Jenny Holzer or Ryan McGinness is, but one look at a radiant child and even a housewife in one of the square states would be able to track its origin. Haring’s work has probably become the most marketable of any artist (save maybe for Warhol, of course), with not only t-shirts bearing his graphics, but also Sigg bottles, umbrellas and a line of shoes designed by Nicholas Kirkwood. KAWS has done a lot of things in his career — working for Disney, landing on magazine covers, designing snowboards — but one thing he accomplished that was probably furthest from his mind is making fashionable clothes. His OriginalFake t-shirts featuring a collage of his signature graffiti style and a pin-up girl arguably looks the most like something you’d see walking down the runways. 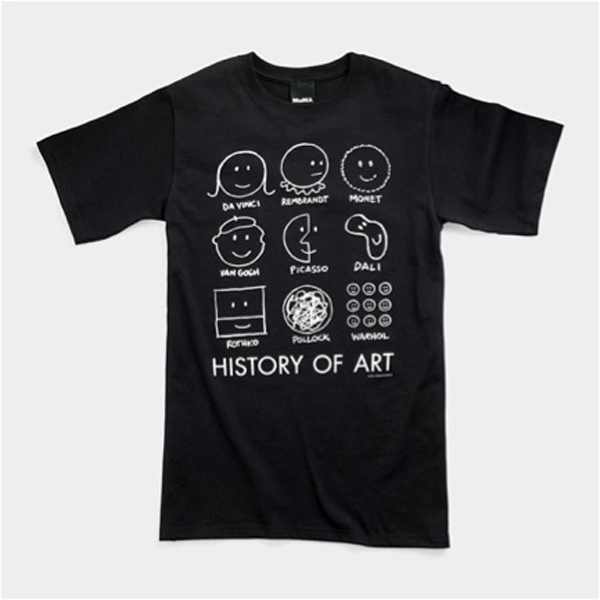 This one might not technically be an artist-meets-mass-market-apparel deal, but it’s a cute enough distillation of the entire narrative of art history into a simple graphic tee. The van Gogh face is a little disappointing, though. Not only does it bypass his post-impressionist style, it also propagates the urban legend that he hacked off his entire ear. But, how much can we really expect from a t-shirt?